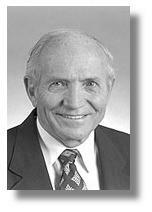 Donald Eugene Strandness Jr. was born in Bowman, N.D. in 1928. He and his family moved to Olympia when he was 10. He graduated from Olympia High School in 1946 and then at the Pacific Lutheran University, where he was named a distinguished alumnus in 1980. Strandness graduated from the University of Washington School of Medicine in 1954 and entered their residency program between 1955-57. In 1963 he joined the faculty of the department of surgery and was Board certified American Board of Surgery in 1965, being enrolled in the Cardiovascular Training Program. He started as an instructor in Surgery in 1962, became Associate Professor in 1966 and then full Professor in 1970. In the early 60's he was heavily involved with doppler devices built by bioengineers at the University of Washington, the team being led by Robert Rushmer, Dean Franklin and Donald Baker. He was responsible for most of the early clinical trials in the department using these pioneering equipments. 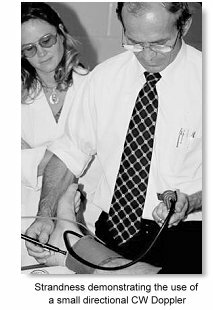 His systematic studies documented and validated the method as applied to vascuar diagnosis. Physicist Gene Hokanson joined Strandness in 1965 and began his career in vascular technology, using his knowledge of physics and electronics to develop and build various non-invasive instruments. In 1966, Strandness was also joined by David Sumner who had just finished his surgical training. Together they they wote a short booklet called "Hemodynamics for Surgeons". The work evolved into an important guide for applied vascular physiology. Strandness, Sumner and Hokanson hosted a Doppler display at the American College of Surgeons Conference in San Francisco in the same year. In 1967, Strandness published on the differences between normal and abnormal wave profiles using spectral analysis, and assigning particular waveforms to specific disease conditions such as arteriolar stenosis. From the carotids he had moved on to the peripheral arteries and with some initial failures Strandness finally succeeded with duplex pulsed ultrasound equipments put together by John Reid, Donald Baker, Vernon Simmons, George Tome, AWC Nation, JM Ofstad and Frank Barber. Many other important scientists also contributed along the way. Strandness served as head of the division of vascular surgery until July 1995. Strandness' research Interests is on Natural history of renal artery stenosis, surveillance of vein grafts, natural history of acute deep vein thrombosis. He has authored or co-authored 450 original articles, 176 book chapters, 15 books and 94 abstracts, primarily involving study of the natural history of vascular disorders. His popular book "Duplex Scanning in Vascular Disorders", first published in 1990, went through to the 3rd edition in 2001. He serves on the editorial board of six major journals and is executive editor of two new journals on the subject of vascular disease. He helped found the Intersocietal Commission for Voluntary Accreditation of Vascular Laboratories, which sets standards for accreditation of vascular laboratories nationwide. He has received numerous other awards and honors, including the University of Washington School of Medicine Distinguished Alumnus Award, 1997; Cid Dos Santos Boehringer Mannheim Prize, 1980; Merit Award from the National Heart, Lung and Blood Institute, 1987; Albion O. Bernstein Award from the Medical Society of the State of New York,1995, for outstanding research. He was also awarded an honorary Doctor of Medicine by the University of Lund, Sweden. Strandness has been known to his friends and colleagues as a hard-working, warm and modest person. He once said in a public speech: "I have come to the conclusion that success occurs because of a combination of family values and of ideals, stubbornness, A modest intellect and the ability to work hard when others are playing." This philosophy had been the guiding light throughout his life and career. Strandness passed away after a long illness in January, 2002. Read also "D. Eugene Strandness, Jr, MD, and the Revolution in Noninvasive Vascular Diagnosis" Part 1, Part 2 and Part 3, by Kirk W. Beach, PhD, MD, Department of Surgery, University of Washington, Seattle, Washington USA, published in the Journal of Ultrasound in Medicine, 2005. Copyrighted the American Institute of Ultrasound in Medicine. An audio transcript of "Typical Doppler Sounds from peripheral arteries and veins" prepared by Dr. Strandness in the late 1970s can be downloaded here, courtesy of Dr. Eric Blackwell. Photo on the right courtesy of Dr. Eric Blackwell.